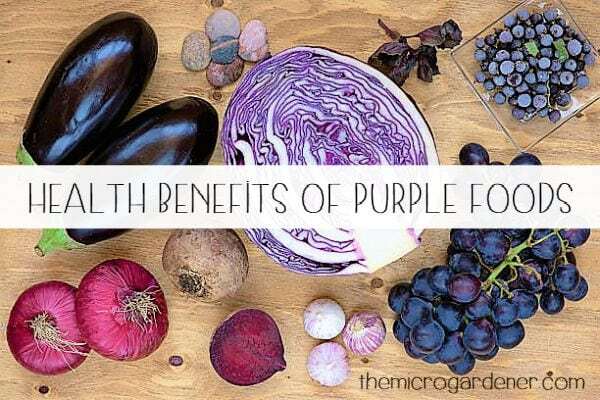 If you’re interested in good health, or are growing an edible garden, have you heard about how purple foods can benefit you? In this article, I share 50+ purple fruits and vegetables you can eat and grow, as well as their special protective health benefits, so let’s dig a little deeper. If you’re a food gardener, it’s likely you’re aware that eating a variety of fruits and vegetables is healthy. It’s also one of the easiest ways to prevent disease. That’s why I’m growing my own healing, nutrient-dense food garden. I’ve intentionally planted a rainbow of foods including those with purple pigments like eggplant, sweet potatoes and mulberries. Why? Because edibles with diverse colours and in different plant families each provide us with unique nutrients. Every food crop (vegetables, fruits and herbs) have different nutrients, so expanding the variety of colourful foods you eat can help boost health. More on that in a moment.